Last week Michael reported on a tour we took of the Millwork District in Dubuque, IA, while we were in town for the Growing Sustainable Communities conference. 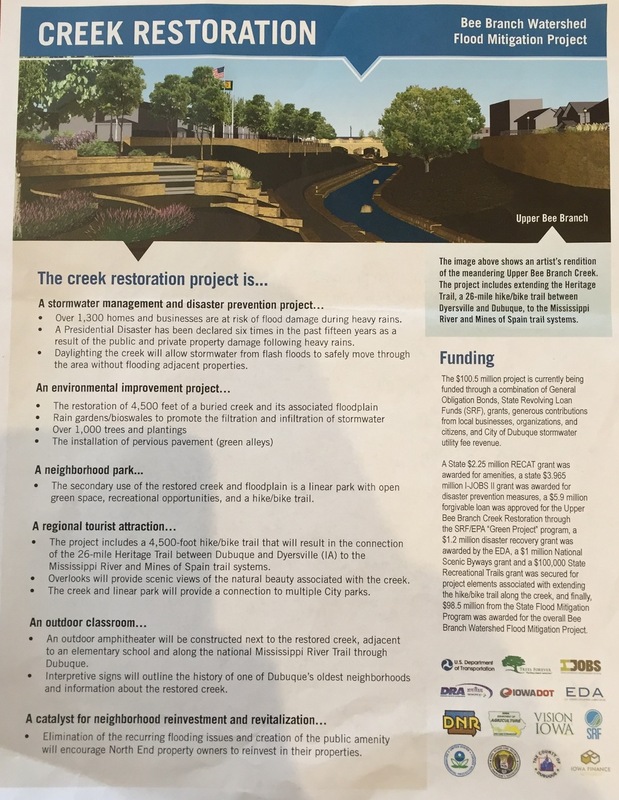 Today it's my turn to share a few details about the second half of that tour, which provided a look at the city's innovative work to solve a common problem -- flood mitigation through storm water management. Bee Branch Creek runs through neighborhoods on the north/north-east portion of Dubuque. The above image shows the area of the city that makes up the Bee Branch watershed, approximately a quarter of the total land area of the city and a section of town "where over 50% of Dubuque residents either live or work." In the past, as the city developed and industry encroached on the banks of the lower Bee Branch, the city chose to manage the creek by directing its current underground. My apologizes for the poor quality of this photo, but you can imagine what it portrays - a "sea of asphalt" which was once parking lots for large factories. When the factories closed the parking lots remained and the Bee Branch continued to flow under all that pavement, constrained by pipes on its way to the Mississippi. But in spite of being hidden, Bee Branch has caused a lot of problems for the city. Urban streams such as this are the natural conduit for storm water runoff, and development doesn't just mean that houses are built right up to (and in the case of the buried Bee Branch, sometimes right on top of) the path of the stream, it also means lots of places that were once grass are now paved. Driveways, streets, parking lots, are not porous, and heavy rains turn streets and alleys into rivers and parking lots into lakes. Dubuque has the added complication of topography that slopes dramatically down from bluffs to the river. Additionally, in recent years Dubuque has experienced more than its fair share of short term, heavy rainfalls. All of these factors combined for a predictable result: "Between 1999 and 2011, six Presidential Disaster Declarations were issued with total damage estimates of almost $70 million." Faced with the perpetual threat of flooding coupled with a desire for further redevelopment of the north side neighborhoods, the city sought a solution that would serve both purposes. Dubuque has an existing sustainability framework that guides the all of the decision making and projects undertaken within the city. Above you can see how the Bee Branch project meets the principles of sustainability and informed various aspects of the project. Of note is the "Community Design" principle. The project began with a 16-member citizen task force, a group that recommended a process called "daylighting" that was ultimately adopted. I don't have insight into how long that task force met, who the members were, or whether or not they were spoon-fed possible project methods. What I DO know is that the involvement of a citizen task force almost certainly increased the length of time necessary to begin this project (the city could easily have just said "This is what we're doing. Period." and moved forward). The decision to day-light the creek and to attack the full nature of the problem in the Bee Branch watershed was no small undertaking. The project spans 35 years (!!) and has a total cost of just under $200M. 1. The purpose (perhaps a secondary purpose but nonetheless a purpose) of this grant was to prevent an immediate spike in residential stormwater utility fees, and to decrease the length of the project. Limiting the fiscal impact and inconvenience to residents and local business improves buy-in and sends a powerful message about the purpose of a project. 2. Iowa has created a variety of creative financing options to facilitate the ability of cities to fully address problems like flooding rather than choosing piece-meal, incomplete solutions. Increasing the size of the underground pipes was an option. Buying up and demolishing hundreds of properties was an option. Neither would have actually addressed the full extent of the problem NOR would they have met the sustainability principles held by the city. 3. Seeing state sales tax very tangibly reinvested into their local economy for a project that will significantly improve quality of life for local residents is a win-win for the city and state. We all pay sales tax every day -- how often are we reminded of a local, tangible project that is funded by said sales tax? One local example: this year Rockford has posted some signs stating "This roadway project funded by CIP sales tax". Seeing a road resurfaced and knowing that the extra 1% you've been paying on purchases financed that project is a powerful message. This last picture shows a newly-rebuilt alleyway, one of dozens that will ultimately be resurfaced with permeable pavers as part of the overall Bee Branch plan. I love this alley so much that there will be a later post devoted entirely to it, so I won't say anything about it other than gosh, isn't it beautiful? The Bee Branch project is well underway and, so far as we were able to ascertain from the tour, the project materials, and the statements of the city staff, it has been enormously successful. What lessons can we learn from this success? 1. Guiding principles such as the sustainability principles held by the city of Dubuque make every project, every decision, much simpler. By this I do not mean it makes them EASIER. The decision to daylight a creek that had been buried for years, that runs through neighborhoods and business districts, that requires $200M and decades of work, was certainly not easy. However, having goals and standards in place helps eliminate options that don't meet those standards and keeps competing interests from subverting or distracting from the ultimate goals. 3. Creative and flexible financing and cooperation from local, regional, and state agencies is, well, just a gorgeous thing to behold, especially in contrast with the utter chaos that exemplifies governance in Illinois. Iowa recognized that flood mitigation was a major priority, and set up methods for local municipalities to address this problem head on. This carries a similar message as #2, that there is a level of trust and "we're in this together" that will allow Dubuque and other cities facing the problems the Bee Branch has cause to fully, completely, address the problem, and to fully, completely, address it in their OWN WAY. I'm as surprised as you that I have such strong feelings about storm water management! Thank you, Dubuque, thank you, Bee Branch, for some great lessons. **In case you're interested in following the Bee Branch project further, it has its own Facebook page to keep residents up to date with progress and next steps. Pretty cool.